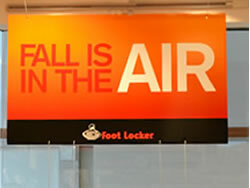 Hanging Signs Elevate Your Business or Promotional Message for All to See! 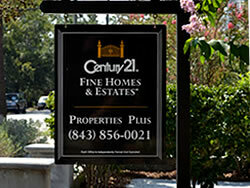 Hanging signs are extremely effective in reaching potential clients for your business or promotion. Hanging signs are important not only for proper business identification, but for brand building and advertising. These hanging signs can be much more appealing and profitable, and compliment your business signage, due to their placement. An elevated positioning of your business signage allows you to stand out and be noticed amongst other businesses, that may be seeking the same target audience. Hanging signs are available in a variety of materials, all durable, long lasting and customizable. Regardless if your hanging signs are for indoors or outdoors we can assist you in selecting and designing the ideal hanging sign that not only compliments your business or event, but takes it to new levels. 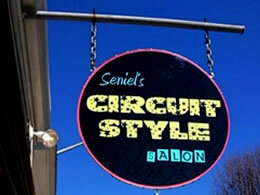 Proper installation of your hanging signs is imperative to a successful business image. We carry a complete line of mounting hardware that accessorizes your hanging signs and in return produces the stylish and professional business image you seek. Hanging Signs and Some Materials They Are Available In. 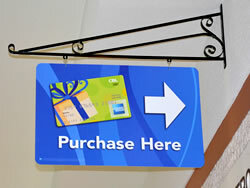 Acrylic Hanging Signs present a very sleek, polished contemporary business or promotional image. Acrylic hanging signs are the first choice when you want to create upscale, designer hanging signs for your business or promotion. Acrylic hanging signs are completely customizable. 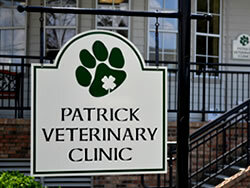 We offer acrylic hanging signs in any size, shape, color or style. For a more dimensional, 3D appearance combine different thicknesses of acrylic (we carry five thicknesses) into your hanging signs. For easy and professional mounting of your acrylic hanging signs, we suggest our stainless steel ceiling mounting kit. Foam Core Ultra Hanging Signs are highly recommended when you are in need of interior signage. Perfect for retail applications and other interior hanging sign needs. Foam core ultra is far superior than traditional foam core because each sheet is coated with thin, solid, perfectly smooth plastic. This sealant makes is more resistant to scratches, indentations and smashed corners. With its waterproof characteristics and durability its easily handled, installed and transported. And with proper storage can be used time and time again. 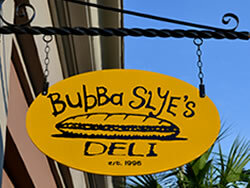 PVC Hanging Signs are one of the most popular choices for interior hanging signs. PVC is ideal for interior applications because of its lightweight nature and ample customization options. We carry PVC in three different thicknesses, allowing you to customize your hanging sign to your exact needs and specifications. Combing different thicknesses of PVC allows you to create a dimensional hanging sign, like no other. Available in any shape, size or style, PVC hanging signs continue to be the standard for quality interior hanging signs. We do not recommend the use of PVC outside, the change in temperature and climates may cause the material to warp. Banner Hanging Signs are economical as well as one of the most versatile hanging signs on the market today. Banners make excellent hanging signs, not only because they are lightweight, but because they also are extremely simple to install. With a variety of finishing options we can customize your banner hanging signs with the perfect hardware for a seamless installation. 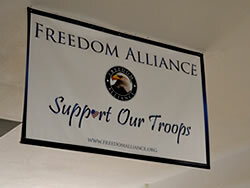 Our banner hanging signs are produced with vibrant colors, sharp details and crisp, easy to read text. These hanging signs are available in a glossy finish or a more conservative matte banner material. In addition, banner hanging signs are easy to store and reuse, making them a wise investment for all businesses or promotions. 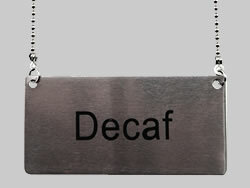 Engraved Hanging Signs add a personal touch to any business or personal space. 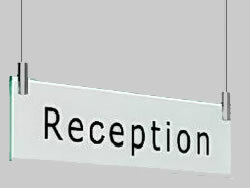 Engraved hanging signs are available in metal, plastic and acrylic. With a large assortment of material and engraving colors available you can customize your hanging sign to reflect your business or personal taste. Engraved hanging signs are a great choice for organizational efforts as well as general business or promotion advertising. 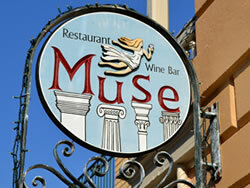 Aluminum Hanging Signs are present everywhere, simply because they work. Aluminum hanging signs are an effective and affordable way to promote your business or event. Because our custom aluminum hanging signs are available in five thicknesses you can select the appropriate thickness for your application, climate or mounting location. Our aluminum hanging signs are available in the traditional shapes (square, rectangle and vertical rectangle) as well as any custom shape. A custom shaped hanging sign is bound to get more attention in a sky full of competitors and their traditional approach to signage. Why not combine your aluminum hanging signs with our custom scroll brackets for an even more stylish, designer, high-end business image. 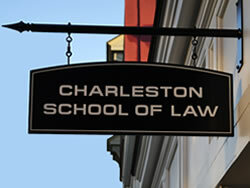 Alumalite Hanging Signs are commonly chosen when you are in need of a lightweight but durable hanging sign. Alumalite's construction makes it lightweight but extremely strong. Produced with a corrugated plastic core that is sandwiched between two factory sealed sheets of aluminum, alumalite is exceptionally strong and rigid but doesn't carry the weight that other heavier hanging sign materials have. We produce alumalite hanging signs in our traditional shapes (square, rectangle and vertical rectangle). Because of alumalite's construction, traditional shapes commonly produce the best quality hanging signs. For an extra professional appearance, finish off your alumalite hanging signs with our custom trim cap. Trim cap not only provides additional protection to the edges, but provides your hanging signs with a framed out appearance. Dibond Hanging Signs are the some of the strongest hanging signs available. Dibond is made from a solid plastic core between two solid sheets of aluminum. The plastic core adds thickness, body and rigidity to hanging signs but remains lightweight. Because dibond hanging signs are lightweight, they are easy to install, mount or hang. When designing your dibond hanging signs, the options are limitless. Offered in two different thicknesses, both of which are available in any shape, size or style, allow dibond hanging signs to be customized to your exact specifications. And since dibond hanging signs are also rustproof, waterproof, rot-proof and chemically resistant, they are ideal for exterior applications as well as interior. ARMOUR-Wood Hanging Signs have superior construction and versatility. ARMOUR-Wood hanging signs combine the strength of wooden signs with the durability of factory sealed high gloss aluminum. The solid wood core is surrounded by heavy gauge aluminum sheets, producing the strongest hanging sign material available. Our ARMOUR-Wood hanging signs are 1/2" thick and are available in any traditional shape as well as any size. Standard with all ARMOUR-Wood hanging signs is our custom trim cap. Trim cap not only offers additional protection to the edges of your hanging signs but creates a decorative, professional frame around your sign. Our trim cap is available in custom colors and can be used to contrast your hanging sign or discretely blend in. Coroplast Hanging Signs give you the ability to reach and promote your business or event to a large audience, all at an affordable cost. Our coroplast hanging signs are crafted and printed to exceed your personal or business needs. Coroplast, also known as "plastic cardboard" are perfect for repeated outdoor and indoor use, allowing you to consistently move ahead of your competition. For ease in installation, your coroplast hanging signs can be crafted with grommets, creating a professional and durable hanging sign. Dura-wood Hanging Signs have long been the hanging sign material standard. Dura-wood hanging signs are not only affordable, they are lightweight, durable and portable, making them easy and quick to install. Dura-wood hanging signs can be used just about anywhere to advertise and promote your business or event message. Properly mounted Dura-wood hanging signs command the attention of potential clients, patrons and and even just those passing by. Due to modern manufacturing advancements these hanging signs are more durable then ever before, making them a wise investment for your business or promotion. Sandblasted Redwood Hanging Signs have rich natural beauty and a long lasting durable, performance. Our redwood hanging signs are less likely to split, cup, warp or chip than any other wood used to produced hanging signs. Sandblasted redwood hanging signs provide you with a naturally beautiful hanging sign with quality performance. Because of redwood's natural and organic nature, all of your hanging signs produced are crafted with an unique look and finish. We can create your hanging signs in any shape, size or style you seek, in addition can be one or two sided. With proper care and installation your redwood hanging signs will continue to work for you and your business for years to come. 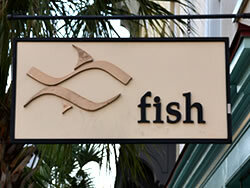 HDU Hanging Signs can give you the appearance of a wood sign, all without the weathering problems. 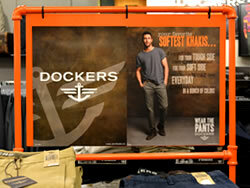 We offer HDU hanging signs in a variety of textures and styles. These options give you the opportunity to create a hanging signs that fit your business and personal image. Whether it's a wood grain, smooth, pebble or venetian finish, your hanging signs will reflect you and your business with style and professionalism. 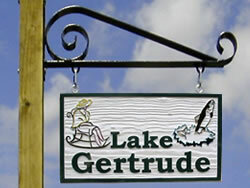 HDU signs are crafted with a "carved" appearance. Raised letters, numbers, logos and images produce a dimensional hanging sign, that is built to last. HDU (High Density Urethane) is produced to be waterproof, rot-proof and chemical resistant. It is a great choice for all your exterior hanging signs as well as interior hanging signs. What type of Hanging Signs are Right for You?